A silly ole bear named Pooh and pink pal Piglet take Walt Disney World guests on a whimsical journey into the storybook pages of the Hundred Acre Wood. 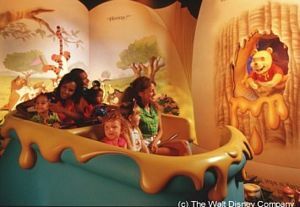 Good times with the Hundred Acre Wood gang begin as guests hop aboard golden "hunny pots" and travel through a Blustery Day. Howling winds stir up a whirlwind of adventure as Owl's house topples, Piglet is swept into the groaning gusts and baby Roo gleefully swings from his scarf, tethered like a kite in the wind. Despite the wayward weather, Pooh is "bearly" bothered and continues his ongoing quest for honey. Night has now fallen upon the Hundred Acre Wood and hoo, hoo, hoo else but Tigger springs into the adventure with a bouncy, trouncy, flouncy game of hide and seek. Hunny pots bounce along the darkened path chasing a topsy-turvy Tigger to the fun-loving tune, "The Wonderful Thing About Tiggers." The bouncefest leads to Pooh's house where he stands guard over his prized honey into the wee hours of the night. The wary bear drifts off to sleep only to dream of the dreaded honey-stealing Heffalumps and Woozles, forewarned by Tigger. Wacky, glowing creatures surround the hunny pots as they drift through a silly dreamscape full of song and surprise. As the story unfolds, squalls swell into a storm with the worrisome gang enveloped in the elements. Hunny pots bob swiftly along the rising waters and swirling whirlpools as the Hundred Acre Wood transforms to a Floody Place. Eeyore, Roo, Kanga, Rabbit, Owl and Tigger band together forming a rescue chain to save Piglet from falling over Floody Place Falls. Meanwhile, Pooh has taken advantage of the rising waters to reach the top of the honey tree. A happily-ever-after storybook ending features a hero's party, a colorful rainbow and all the gang safe in the Hundred Acre Wood ready for another escapade with the young boy who inspired the "Pooh Corner" tales, Christopher Robin. Put small children in the front seats, otherwise their view may be obstructed by people sitting in front. Fastpasses tend to run out fairly quickly in peak seasons for Pooh, due to its low load capacity. If its one of your 'must-do's', then stop by early in the day to avoid disappointment or long lines. There is a mild thunderstorm sequence during the ride which may worry the younger ones so be aware. Each 'hunny pot' holds 4 people. A reasonably new addition to Fantasyland, 'The Many Adventures of Pooh' opened in 1999 on the former site of 'Mr Toads Wild Ride' Look carefully as you ride and you'll see a mural on the wall which shows Owl being handed the deed to the ride from Mr Toad himself. The characters from The Many Adventures of Winnie the Pooh were created by English humorist and author A. A. Milne in a series of stories about a boy, Christopher Robin, and his stuffed bear. Guests must transfer from ECVs to available wheelchairs to experience the attraction.